At the Group’s Annual General Meeting held in Bochum, Germany CEO Frank Appel announced paying €1.05 dividend per share. This reflects an increase of €0.20 over the previous year. In his outlook, he envisaged a new record profit in fiscal 2017, rising from €3.7 bn gained in 2016 to €3.75 bn this year. The Hamburg-born manager also announced to successively investing in the company’s expansion and modernization of infrastructure. Speaking to shareholders, Frank Appel voiced his optimism that global trade would continue to grow despite mounting protectionist tendencies. "World trade drives prosperity, and prosperity promotes peace," he emphasized at the logistics giant’s annual meet. By indirectly addressing isolationists like Brexit supporters, European populists and Washington’s Trump administration he stated: "We don't need less globalization, but more - and we need it now and sustainably." In his speech, Appel urged countries to invest more heavily in education and infrastructure in their own interests to pave the way for long-term growth. 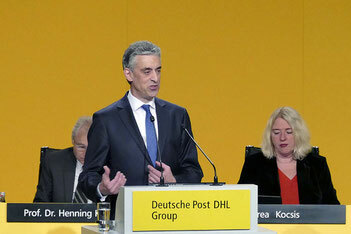 Deutsche Post - DHL Group connects people and markets all over the world, he said, stressing that the company would continue to serve as an advocate of free trade and global interaction in the future. “Logistics is the backbone of trade,” he said, while pointing out that his Group is extremely well positioned in the market. "Of all logistics service providers, we have the strongest global presence. We have the widest range of offerings and most extensive experience. As the market leader, we have a clear idea of how our industry can continue to contribute to global prosperity," Mr Appel stated. In view of the record year 2016, DP-DHL confirmed their shareholders during the Bochum gathering a proposition made two weeks ago at the annual conference of paying shareholders a dividend of €1.05 per share. Appel was particularly pleased that all four divisions had contributed to the Group’s positive performance in 2016. Post - eCommerce - Parcel (PeP) posted the highest earnings since 2008, while DHL Express and Supply Chain were able to increase their margins and achieve record earnings. Global Forwarding, Freight also improved considerably in a persistently difficult market environment. The company continues to benefit from its excellent market position in global growth segments - particularly in the area of e-commerce. The Post - eCommerce - Parcel (PeP) EBIT contribution rose to more than EUR 1.4 billion, compared with EUR 1.1 billion a year earlier. The DHL divisions generated an operating profit of 2.4 billion euros, compared with 1.7 billion euros in 2015. The positive development of earnings in addition to the strong operating business in all divisions also benefited from the omission of one-off charges. 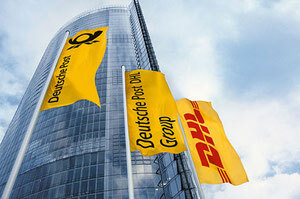 Touching environmental issues, the manager said that DP-DHL exceeded its own goals in 2016 and passed an important milestone. In 2008, the Group set itself the target of improving carbon efficiency by 30 percent over the 2007 baseline. "We achieved the goal in 2016 - four years ahead of time,” Appel announced. Speaking about the ground infrastructure, the manager confirmed his firm’s strategy to modernize and expand warehouses, sorting centers or distribution depots continuously. Next on the agenda is a further parcel center that will be built on the former site of car producer Opel at Bochum, offering a throughput capacity of up to 50,000 items per hour. Construction of this facility, offering 600 new jobs, is scheduled for the coming months. A similar facility had been built near Frankfurt last year, creating also 600 new jobs.